Dumbledore’s owl lectern, a Hogwarts knight, and the Gryffindor notice board with 4 blackboard recolours (including two simlish ones I made myself). Quidditch Stuff; The chest and Nimbus broom I’ve shared before, but you get two recolours of the broom here, the black Nimbus 2001, and a brown unmamed broom, not shown. The Golden Snitch has an issue where you can’t see the wings from all angles, but I’m including it anyway. Lots of Small deco; including book piles, wands, hats, chess set, chocolate frog, Harry’s glasses, Hermione’s bag, a mandrake, The Monster Book of Monsters, and everything else in the picture. The white owl is the mesh, the grey one is the recolour. 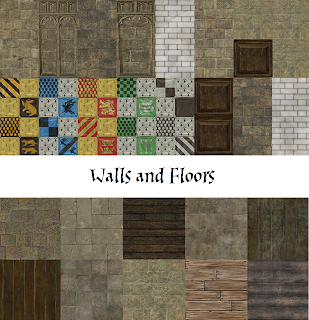 16 Walls and 10 floors, also from the Harry Potter games. 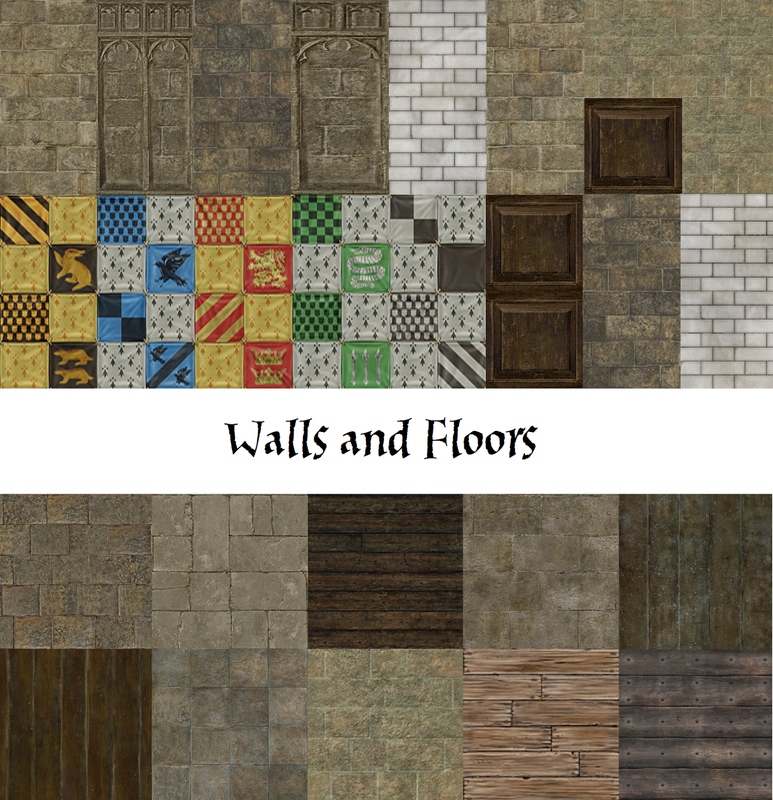 Some of the walls are pairs that can be used together to make a seamless texture. And Lastly, YanderePlum’s TSM witch hat as deco; The Mesh is the plain brown one, the other three are recolours. It totally looks like the sorting hat! Before you download: Everything is in Deco Misc., except the Magic Cooking Fireplace which is in Appliances Cooking. High Poly warning: The following items are a bit high in polys: Monster Book of Monsters (around 1000 polys), Death Eater Mask (2034 polys), and owl lectern (2605 polys). Everything else is below 1000 polys. Sure, go ahead and convert them! just remember to credit me! Thank you so much! I will definitely leave you credit, in both the buy mode description and on my site! I'll post a link here, too, so you can see the finished product :D. Thanks again! I own TS4, So I'm Just downloading your Hogwarts stuff pack, as I do own Sims 4, although I've never bothered learning to create for it. I've also followed your tumblr! They are straight from the HP video games, though I had to mess around with them a bit to get them working in the Sims 2. Amazing stuff, I'm dying to have it for TS3! I wondered if you were ok with an artist from The Sims Resource could convert them? With your credits of course! Yes, you may convert them as long as you give me credit, and as long as they remain free.